Renowned for its legendry fry-ups down in Stokes Croft, The Bristolian certainly won’t disappoint. Its menu is a homage to the Full-English Breakfast, old and new. This really is one of Bristol’s best for a spot of brunch. Just be sure to get there early on weekends. As you open the door of The Bristolian, you’re welcomed by the rich smell of freshly ground coffee (which is all local, by the way). Plates of bacon, garlic mushrooms and toast whisk by you, customers smack their lips. At the counter, you’ll see bowls overflowing with freshly made goodness. A range of green salads and some more original numbers make up an impressive counter that just looks healthy, while perched on top is a huge selection of homemade cakes, brownies and tarts to tantalise you while you order a coffee. Everything here is done well, and while it may seem small and quaint, there is much more to this café than meets the eye. Firstly, it serves breakfast, lunch, dinner, and everything in between- not an easy feat for five floor staff. Every café should have a good number of different teas and coffees on offer, but you get the feeling that the people behind The Bristolian have gone the extra mile to impress with locally ground coffee and an extensive range of leaf teas. If you’re lucky enough to nab a table on a weekend morning, treat yourself to one of the cooked breakfasts. My recommendation is The Bristolian Fusion, a Moroccan-inspired full English complete with fried eggs, fried potatoes, garlic mushrooms, a warm flatbread, cucumber yogurt, tomato salsa and free-range chorizo. 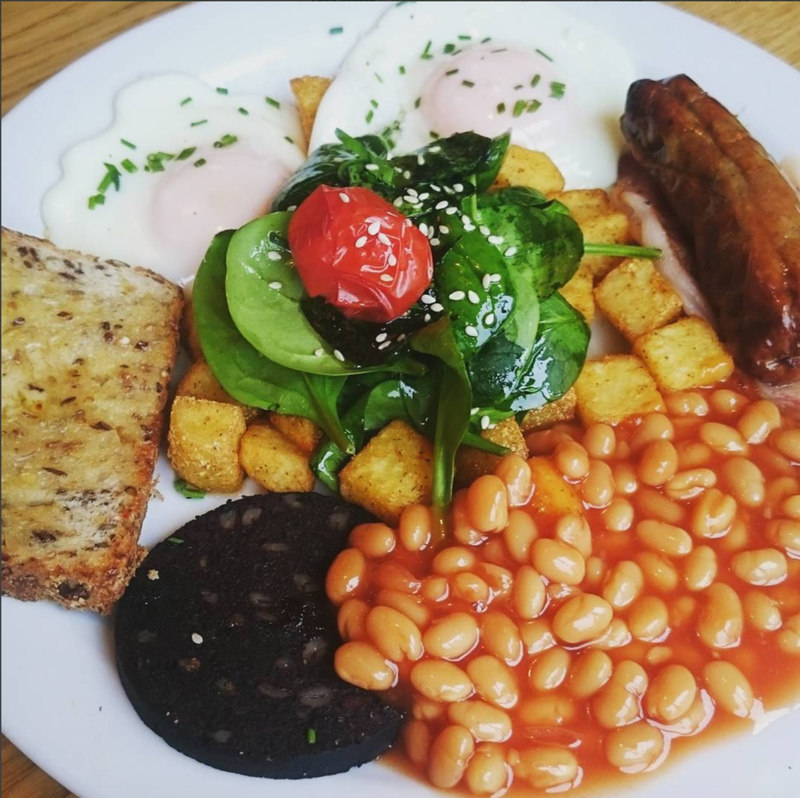 All of the breakfasts are proper, money’s worth, belly-filling portions laden with fresh ingredients, from their muesli and fruit compote to ‘The Bristolian’ breakfast- an overload of full English that includes free-range sausages, bacon, tomatoes, beans, spinach and crispy fried potatoes for £7.95. 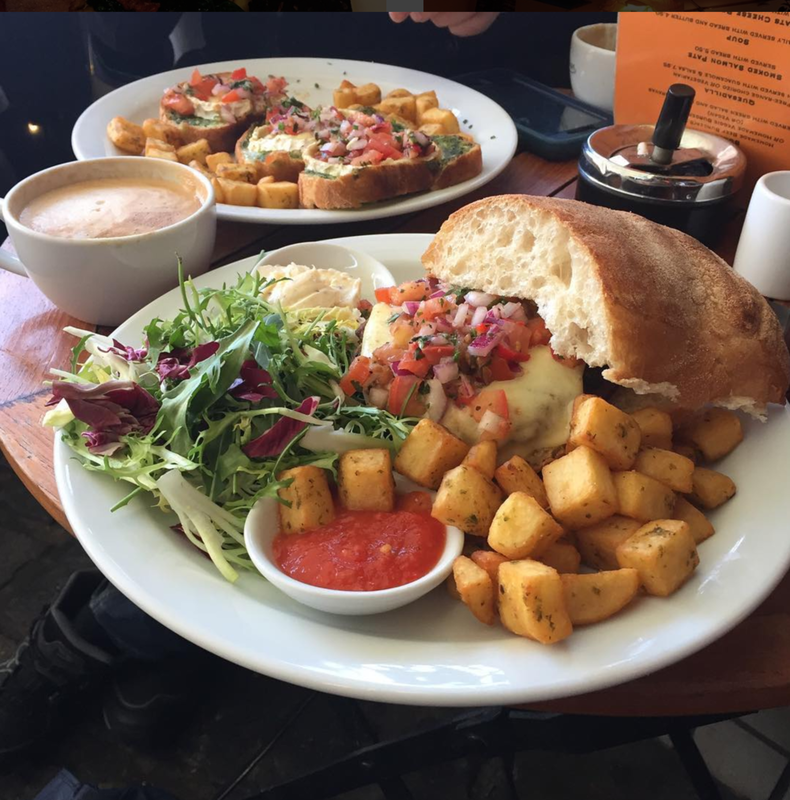 For lunch you can expect more fresh flavours, with salads under the counter (3 for £4.95 and 4 for £6.95) and an a la carte menu of simple but tasty burgers, bruschetta and soup. The dinner menu has some certified crowd pleasers at reasonable prices, with more tapas-style options such as olives (£2.95), hummus & flatbread (£4.95), goats’ cheese & chilli bruschetta (£5.60), baked camembert (£7.95) or wild mushrooms with gorgonzola and walnuts (£5.95). Cakes are available all day and are really quite special, from their rich peanut butter brownie to their “super healthy” flapjack, they have some sure fire winners. Take your mates or family to The Bristolian when they’re visiting, be it for a hungover full English or a slice of cake and a catch up. As the name suggests, this café has become somewhat a local icon, but still keeps its local charm with lovely staff, colourful décor and delicious homemade food.